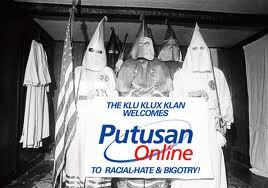 utusan IS racist and very anti DAP – welcome! 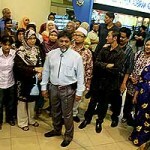 who the hell is going to believe utusan malaysia when it insisted that it is not racist? right through and through, it was so obvious we can see how racist it has been… and i’m sure it will continue to be as racist as ever, because it is umno’s mouthpiece… and umno is the federal govt… thus nobody can touch utusan! beside being racist, it had been constantly attacking DAP, especially penang’s CM, LGE. and it has the cheek to accuse LGE as racist and anti malay instead. where is the proof for that, utusan? whatever proof you have though, were lies or had been rebutted by DAP. in the latest incident, utusan attacked LGE against his speech made during the recent PR convention. this time DAP had enough and wanted to sue utusan but before that LGE called upon utusan to apologise… then they won’t be taken to court. btw, on that day, it seemed that utusan suddenly gave special coverage to DAP – with 6 pages! apologise? no way! that word is not in umno’s vocabulary. they’ll never ever apologise esp. to a non umnoputera, a non malay. why in the world is utusan so aggressive and passionate in attacking DAP? of course! trying to poison the malay’s mind against DAP/LGE. trying to bring down DAP/PR as govt. of penang! 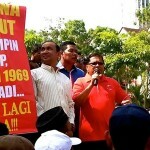 trying so hard to please its masters – those top umnoputera in the cabinet. shame on utusan! indeed DAP’s tony pua was right to say that utusan is the single largest hindrance to national unity.